This continues Acrobat’s popular and long-established series of annual collections of the biggest hits of the year in the USA. 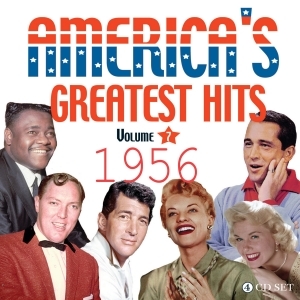 This great value 112-track 4-CD set brings together every record which appeared in any incarnation of the Billboard Top 15 during 1956 – the Best Sellers, Most Played By Jockeys, Most Played On Juke Boxes and the Honor Roll Of Hits, plus those which only appeared in the Cashbox Top 15. As ever, it’s an eclectic and fascinating snapshot of the music business during a time of rapid creative change and development, as the rock ‘n’ roll explosion continued to change the pop landscape and supplant the established stars of the early ‘50s and it makes for highly entertaining listening. Includes some collectable hits not readily available on CD. 6 Song For A Summer Night (Instrumental Version) Mitch Miller & His Orch.